The Cagllari is already the best-bang-for-your-buck pocket bike we carry. Lightweight and nimble, the Cag is a no-frills racing machine designed to keep up with the best the pocket bike world has to offer. By getting the Performance Package along with your Cag, you will have upgraded performance from the NGK™ Spark Plug, which will not only let your pocket bike run faster, but also more efficiently as well. You will also be sporting a new D.O.T. 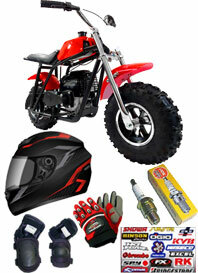 Approved Helmet along with riding gloves, knee pads and elbow pads. Top that off with Racing Decals to customize both your bike and helmet. Save almost 20% when ordering this as a package deal! The Blade 49R is already an awesome pocket bike right out of the box with its low-slung profile and unique features such as a 4-Stroke Engine, treaded tires and C.A.D. Frame. Handling is the Blade's forte. Add the Performance Package to the Blade's already impressive arsenal and you'll have one monster of a bike. A special 4-Stroke compatible NGK™ Spark Plug will burn over 99% of the fuel mixture on every stroke, leaving you with more power, lower emissions and better fuel efficiency. The complete safety package also includes a D.O.T. Approved Helmet, Racing Gloves, Knee Pads and Elbow Pads. 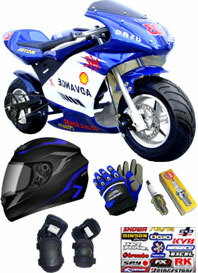 A sticker sheet is also included so that you may design your own unique graphics on your fairings and helmet. Almost 20% off these items when you get this package deal! With its racing graphics and battle scheme paint job, the full-fairing MX3 was designed to look and go fast. Redesigned frame structure ensures optimum road feel and feedback when you are racing on the track. The Performance Package ups the power on your MX3 with a clean burning NGK™ Spark Plug that will allow your 4-Stroke Engine to generate more power while saving a bit more fuel. To handle all this safely, we've included a D.O.T. 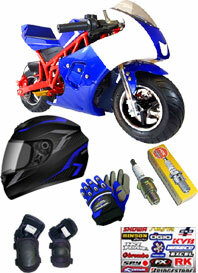 Approved racing helmet, knee pads, elbow pads and racing gloves. 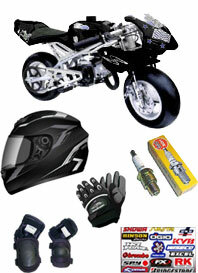 We've also thrown in a sticker sheet so you can personalize your pocket bike and safety equipment as well. You get almost 20% off these products by getting this as a package. One of the latest creations in our lineup, the Phantom RSX is one of the best pocket bikes on the market today. The bright red ladder frame is the stiffest on the market, making it's handling the most responsive and tightest on any bike. Crank up the power of the Phantom's 4-Stroke Engine with our hot NGK™ Spark Plug that burns 99.9% of the fuel mixture on every revolution and customize the aggressive body panels with the included sticker pack. 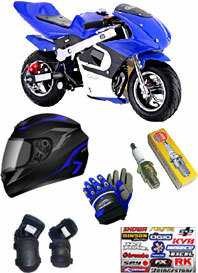 Keeping safety in mind, gear up with the included Knee and Elbow pads, professional Riding Gloves and our D.O.T. Approved racing helmet. The Hotshot TXR is already the baddest bike on the block. With it's exposed engine, fat knobby tires and retro looks, you can ride in true old school fashion. Customize this bad boy with our sticker pack, and while you're at it, customize your D.O.T. helmet as well. And when you're ready to hit some dirt trails or go cruising on your mini bike, glove up with our race gloves and protect those knees and elbows with our protective pads. You also get an NGK™ Spark Plug for that monster 4-Stroke Engine between your legs for maximum torque. Superior build quality and meticulous attention to every detail, the Raptor may be the highest quality pocket bike produced in its class. Sporting a super-stiff ladder chassis and near 50/50 weight distribution, the Raptor is hands-down the most exciting all around pocket bike. Add to that resume with a tuned high discharge NGK™ Spark Plug for your 4-Stroke Engine and you'll have a motorcycle engine that produces more torque while wasting less gasoline (Electric Raptor models will receive Black Safety Goggles instead). A D.O.T. Approved Helmet keeps your head protected while the riding gloves, elbow and knee pads keep you safe from the elements. The included decal sheet allows you to personalize your equipment to make it uniquely yours. You get almost 20% off of the equipment when opting for the package deal. The RS-R is the most unique pocket bike ever created. A MiniPocketRockets' exclusive, this is a conventional sized pocket bike with a 4-Stroke Engine and a racing suspension system adjustable to suit any riding and track conditions. Adding the Performance Package will customize this one-of-a-kind pocket bike and escalate it to the next level. An optimized 4-Stroke NGK™ Spark Plug will ignite virtually every single droplet of fuel in your engine so that your pocket bike will run at its fastest and most efficient state. D.O.T. Approved Helmet will keep your noggin safe while the Race Gloves, Elbow Pads and Knee Pads will shield you from everything else. 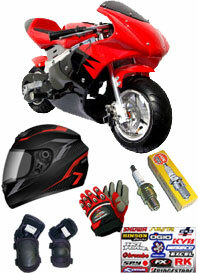 Add some race decals to complete the look of your top-of-the-line pocket bike and safety gear! 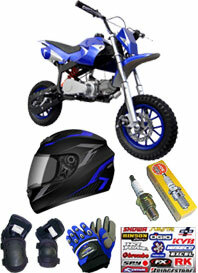 Save almost 20% off the safety gear and modifications when getting them as a package. 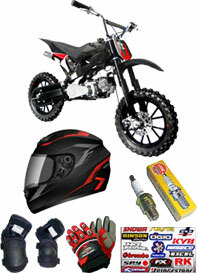 Tackle the wild with the RX1 Traxxis Mini Dirt Bike. A 4-Stroke Engine, knobby off-road tires and a full suspension system means you'll always be looking to blaze new trails. Throw a high discharge NGK™ Spark plug that's optimized for this off-road engine and you'll go farther and deeper into the woods thanks to better fuel efficiency and more torque to tackle tougher terrain. A D.O.T. Approved helmet is a must, along with protecting your hands, elbows and knees with the included Riding Gloves, Elbow and Knee pads. 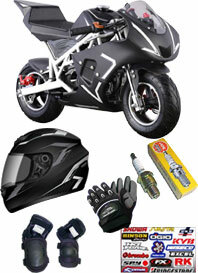 Jazz it all up with the included decals, enough for both your fairings and your helmet! You get almost 20% off the retail price for the accessories when buying them as a package. Large and in charge, the KTX Radical Mini Dirt Bike features a 4-Stroke Engine, extra long suspension travel and high ground clearance to tackle everything from dirt and mud to rocks and gravel. Want to get a little extra out of your engine? A high discharge NGK™ Spark plug will get you farther and faster because it optimizes your engine to use up every single ounce of torque and fuel it has to give. When off-roading, you want all the safety gear you can put on. A D.O.T. Approved Helmet, elbow pads, knee pads and riding gloves will protect you from the elements. The included decal sheet will let you personalize your dirt bike along with your stuff so that you can ride off into the sunset in style! Great deal when getting it all as a package. You save almost 20%.